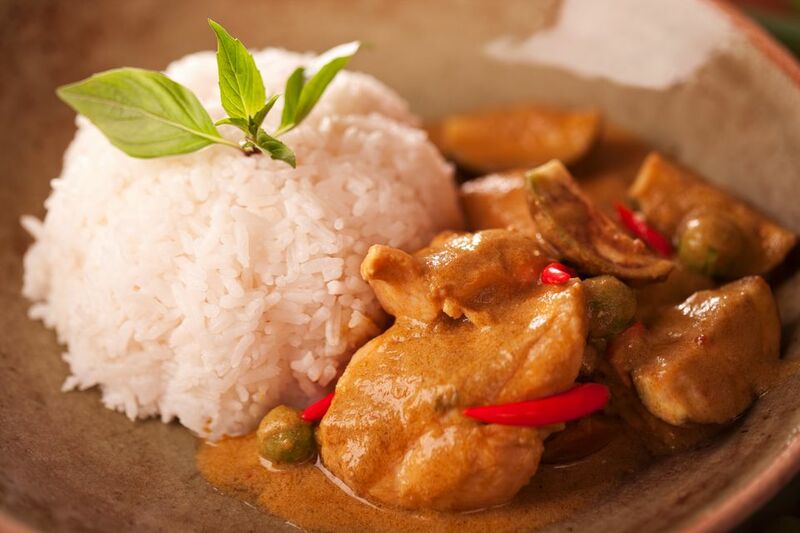 This curry chicken recipe is an instant favorite. It's a classic yellow curry made with chunks of chicken and potatoes and tastes like one of those wonderful curry dishes you can find in the marketplaces and streets of Bangkok. The use of curry powder helps the dish come together quickly and easily. If you don't want to make it from scratch look for a good Madras curry powder at your local Asian or Indian food store. A Madras blend works well with Thai flavors and will give you far better results than your average supermarket curry powder. Enjoy! Preheat oven to 350 F (if using oven method). Place a wok or large frying pan over medium-high heat. Add the curry powder, bay leaf, cinnamon stick (if using) and chili/cayenne. "Dry fry" these spices 1 to 2 minutes, until they are lightly toasted and fragrant. Add 2 tablespoons oil, plus the shallots, garlic, and galangal or ginger. Also, add a few tablespoons of the chicken stock—enough to keep ingredient frying nicely. Stir-fry 1 minute. Add the chicken and potatoes, stir-frying 1 minute to coat with the spices. Add remaining stock plus ketchup/tomato puree, stirring well to combine. Finally, add the coconut milk, fish sauce, sugar, cinnamon stick, and lime leaves or bay leaf. Bring to a boil, then cover and reduce to simmer for 30 minutes until cooked. Or transfer curry to a large covered casserole dish and bake 1 hour at 350 F. Add tomatoes during the last 10 to 15 minutes of cooking (not before, or they will keep potatoes from becoming tender). When chicken is cooked and tender, taste-test the curry for saltiness and flavor, adding more fish sauce as needed until desired flavor/salt level is achieved. Also add more cayenne, chili sauce, or fresh-cut chilies if you prefer it spicier. If too spicy, add more coconut milk or a little plain yogurt. Add a little more sugar if it's too sour for your taste. Sprinkle over the fresh coriander and serve with plenty of Thai jasmine rice.